Keep your Syrian hamster in a wire cage with a solid floor or a habitat with tunnels. 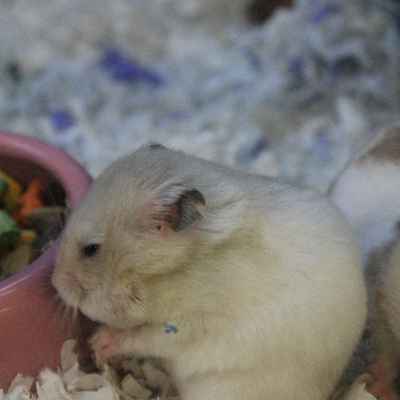 Dwarf hamsters can be kept in a cage made for mice. The enclosure should be placed away from direct sunlight and drafts. Line the bottom of the cage with bedding for added absorbency and odor control. Do not use cedar chips, as aromatic oils in cedar bedding have been shown to have adverse health effects on small pets. Hamsters also love to nest! Provide them with nesting material, such as colorful and fun shredded paper. Spread them around the habitat, and they will forage for the springy shreds and gather them into a comfy nest. Remove soiled bedding, droppings and stale food from the cage daily. Clean the cage completely once a week by scrubbing the bottom of the cage and soiled accessories with warm water and a gentle soap and replacing dirty litter and bedding. Make sure to rinse and dry everything completely before returning it to the cage.